YASINOVATAYA, Ukraine -- Iryna Herashchenko, a member of the Ukrainian parliament and the presidential commissioner for the peaceful settlement of the situation in the Donbass, says Kremlin-backed separatists are not cooperating with an agreement to exchange prisoners. Ukrainian prisoners stand as a militant of the Russian-controlled separatist forces stands guard during a prisoner exchange with Ukraine on December 26, 2014 in the eastern Ukrainian city of Yasinovataya, near Donetsk. 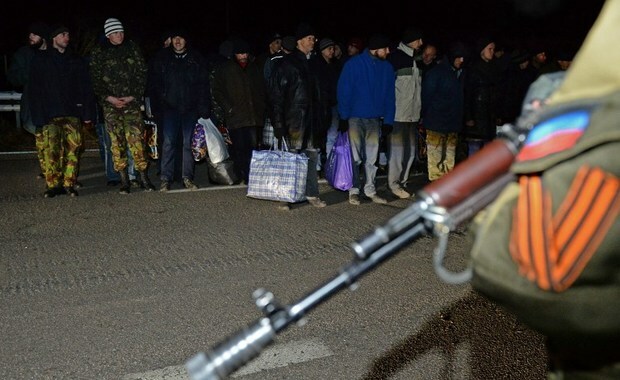 “Those, who went through the hell of (Donetsk) airport, are still in captivity of (separatist) fighters. We mention the names of the heroes in every list for their release,” she wrote on her Facebook page on Jan. 16, referring to the bloody and months-long battle that ended with Russian-separatist forces seizing control of the ruined airport a year ago. In her words, Russian-led separatists have been ignoring Ukraine’s latest proposal to free 25 Ukrainian soldiers, submitted on Jan. 13. An exchange of 50 prisoners on both sides was one of the steps agreed during the first 2016 peace talks, held on Jan. 13. The two sides also negotiated to impose a cease-fire by midnight; however, Ukrainian military reported multiple attacks since then. Two days after the peace talks, on Jan. 15, Yuriy Tandyt, an adviser of the Security Service of Ukraine, said in a Skype interview with espresso.tv that in terms of the Minsk agreements, Ukraine can legally release 35 prisoners. “We are told that we might get 25 or 26 released soldiers back,” he said. A separatist news website in Donetsk on Jan. 17 quoted Denis Pushilin, one of the Kremlin-backed separatist leaders, as saying that Ukraine included into the exchange lists those arrested for political reasons as well as other prisoners. He wants to release only fighters. Earlier Herashchenko said in an interview with the Ukrainskiy Tyzhden newspaper that Russian-controlled separatists often agree to exchange only those Ukrainian prisoners who are on the brink of death. She also said that at the same time they want the Ukrainian side to free criminals who have been convicted even before Russia launched its war in the Donbass.